Harlequin Shrimp larvae (Hymenocera picta) were raised from captive-spawned eggs at 77-79F on artemia. Only two Hymenocera species are known to exist, Hymenocera picta and Hymenocera elegans. 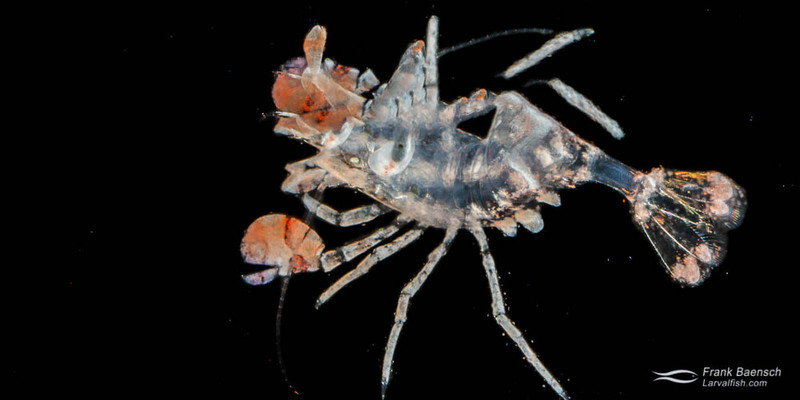 Both species are among the most beautiful and exotic looking ornamental crustaceans in our oceans. Hymenocera picta has more reds and blues and occurs in the Pacific Ocean while Hymenocera elegans has more brown color and inhabits the Red Sea and Indian Ocean. Despite their unusual form and color pattern, neither species is frequently seen in the aquarium trade. One reason is that they are quite rare nowadays and, since they feed at night, difficult to find. The other reason is that they exclusively feed on the viscera of echinoderms, particularly starfish. Both species form long term pair bonds in the wild and, unlike most invertebrates, are able to recognize their partners as individuals. Females are noticeably larger than males and carry the eggs. H. picta is well known in the Hawaiian Islands and used to be fairly common. It will eat any of the starfishes that occur here locally but much prefers Linkia species. I found a Harlequin Shrimp pair requires about one starfish every 4-6 weeks in captivity. H. picta molt about every three weeks. A female produces anywhere from 100 to 3,000 eggs the day after molting. She carries this clutch for about 20 days if fertilization occurs. The eggs hatch over 1 to 2 nights, within 1 hour after the lights turn off. H. picta larvae are able to feed on newly hatched brine shrimp the next morning. Over the next 30 to 50 days they undergo eleven molts before settling as lightly pink colored juveniles. Though the larvae can be raised exclusively on brine shrimp they undergo high mortality at certain stages unless specific conditions are provided. I consider this species moderately difficult to raise. Syd Kraul of Pacific Planktonics first cultured H. picta at the Waikiki aquarium way back in 1986.